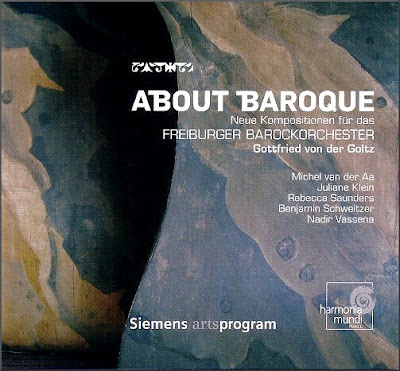 Bracingly acerbic new works for period instruments commissioned by the Freiburger Barokorchester are showcased on the double CD seen above which was released in 2006. A year after its release I broadcast two of the featured works, Rebecca Saunders' Rubricare and Benjamin Schweitzer's Flekkicht, juxtaposed with the Sixth Brandenburg Concerto on Future Radio. This week there was extensive coverage of the excellent news that Rebecca Saunders had won the Ernst von Siemens Music Prize. Predictably the coverage was dominated by Ms. Saunders' status as the first female recipient of the prestigious prize. But none of the coverage mentioned two other salient facts which were highlighted by me in a 2016 post titled 'Beware of classical music's viral circles'. The first is that Rebecca Saunders has quite rightly become one of the pre-eminent composers of her generation despite having a minimal online footprint. The second is she has suffered comparative neglect at the BBC Proms - just one Albert Hall performance - compared with other composers, both female and male, who churn out music more amenable to social media hyping. When will the lazy music media realise we have now reached the tipping point where majoring on a musician's gender becomes a counterproductive cliché? Couldn't agree more about Rebecca Saunders. A very talented composer who deserved to win the Siemens prize. Unfortunately others do not feel the same way and are happy to trot out the usual tired comments about modern music. I couldn't agree more about Rebecca Saunders - a very talented composer who certainly deserved to win the Siemens prize. Martin thanks for that and for pointing out those comments on Slipped Disc which I had not seen. Slipped Disc self-describes as "the world’s most-read cultural website". Which is a very sad comment on the times we live in. We were lucky enough to get the chance to speak to Rebecca (albeit briefly) on Saturday evening after a concert of her music at the Queen Elizabeth Hall on the South Bank. She had previously spoken (as she has on other occasions)during a Q&A session about her interest in the sound qualities of certain instruments. In particular the double bass, and indeed, probably, the best piece of the evening was Fury II for that very instrument.